The deputy chief economist at Canadian Imperial Bank of Commerce is making an impassioned plea to reform the country’s retirement system as quickly as possible. “Add it all up, and there are some 5.8 million working-age Canadians who will see more than a 20-per-cent drop in their living standards upon retirement,” Benjamin Tal said in a report. Canada’s Conservative government is studying the possibility of a voluntary expansion of the Canada Pension Plan, the idea being that working people could pay higher premiums for stronger benefits down the road. It’s not just CPP, Mr. Tal added in an interview, but also the fact that Canadians simply aren’t saving enough. So “we have to be more creative” to encourage savings, whether via CPP, RRSPs or other ways. “Without getting into the politics of it, it is important to remember why a change to the system is essential,” said Mr. Tal. “While many Canadians, particularly those now close to 65, are on a path to the retirement of their dreams, the data show that millions of others are headed for a steep decline in living standards in the decades ahead, particularly those who are currently younger and who are in middle income brackets,” he added. You’re okay if you were born during the Second World War because you’d maintain your standard of living when you take lower expenses into account. The “leading edge” of the baby boomers are set up almost as well. “But their children are much less well positioned, given the current trend towards lower savings rates and reduced private pension coverage,” said Mr. Tal, who arrived at the 5.8-million figure by studying age and income groups. You can read an older report from Benjamin Tal and Avery Shenfeld, Canadians' Retirement Future: Mind the Gap, to get a better understanding of the arguments they use to support their case. Kudos to CIBC for being at the forefront, highlighting the ongoing retirement crisis this country is experiencing and will experience in the future. Tal is right, people aren't saving enough, which is why I'm against the latest proposal of a voluntary CPP expansion as it's doomed to fail (even though some argue for it, I think it should be mandatory). The Tories are backtracking on enhanced CPP but they're putting forth ridiculous policies which will primarily benefit the richest Canadians and the financial services industry catering to them. These aren't the people that need help to retire in dignity and security. By choosing not to reoffer in this year's federal election, Justice Minister Peter MacKay joins a growing list of Conservative MPs who will avoid the impact of pension changes that will triple the amount they must contribute and lock in some of the money for an extra 10 years. Under new pension rules for MPs passed in 2013, all politicians elected for the first time in the next election must wait until age 65 before they can draw a pension. It's more complicated for MPs who have been in the House of Commons prior to January 2016. Their years of pensionable service prior to that date can be collected at age 55. Any pension they earn after January 2016 can't be drawn until they turn 65, according to the Treasury Board of Canada. MacKay's decision not to reoffer was announced last week. He'll be able to collect his full yearly pension of $128,832 at age 55. MacKay's current salary as an MP — $167,400 — combined with his $80,100 top-up as a cabinet minister totals $247,500 annually. MacKay was first elected to Ottawa in 1997 as MP for Pictou County and has been a cabinet minister since 2006. He told reporters in Stellarton last week that he's not reoffering in the next election so he can spend more time with his wife Nazanin Afshin-Jam, their son Kian and their second child, due in the fall. MacKay is the latest in a list of more than 30 Conservative MPs who have said they are not planning to reoffer. That includes a handful of sitting or former cabinet ministers under age 50, including John Baird, Shelley Glover and Christian Paradis. A spokeswoman from MacKay's office refused to comment Monday on whether the upcoming change in pension rules played a role in the timing of his departure. "He is not reoffering so he can spend more time with his family," she said. The Canadian Taxpayers Federation fought for the new rules for MP pensions, which it criticized for being "too generous." The federation has said the new rules should bring them more in line with other plans. MPs elected in 2015 will be expected to triple their annual pension contributions — from $11,000 a year currently to $39,000 by 2017. It's a change that will bring federal politicians closer to a split with taxpayers, who have been paying most of the shot. Taxpayers contributed almost $30 million to the federal plan in 2011-2012. "For every $1 paid in by members of Parliament, almost $24 was being put in by the taxpayer," said Aaron Wudrick, the federal director for the Canadian Taxpayers Federation. "We think that is really out of whack with what most Canadians can expect from their pensions. The new rules will see that ratio brought down to about $1.62 per dollar — so not quite one-for-one, but certainly a lot more reasonable in terms of what taxpayers are expected to contribute." 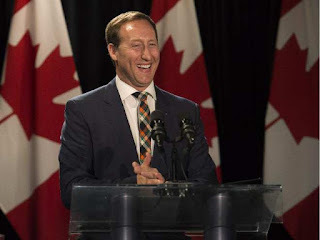 Now, to be fair to Peter Mackay, he spent the last 18 years in federal politics and these are thankless and brutal jobs, especially when you have ministerial duties. But if you think he's quitting politics at the age of 49 to "spend more time with his family," you're crazy. There's no doubt in my mind he and other Tories not planning to reoffer are quitting now to collect that big fat federal pension as early as possible -- a pension they can count on for the rest of their life. They will truly be living the Canadian retirement dream. Who else is living the Canadian retirement dream? All those Canadian public pension plutocrats collecting millions in compensation. They will be taken care of for the rest of their lives too. Unfortunately, for millions of others, this won't be the case. Their retirement dreams will be shattered as they confront a retirement nightmare, living in pension poverty. This is why I keep harping on a mandatory enhancement of the CPP. Canada is on the verge of a major economic crisis and the last thing we need is a retirement crisis to add fuel to the fire. I'll tell you about another person who isn't living a retirement dream, yours truly. If there was any justice in this world, I'd be receiving the Order of Canada or the pension lifetime award for the personal sacrifices I've taken with this blog. I don't want awards, couldn't care less. I just want people to respect the laws of this country and stop discriminating against me and other persons with disabilities when it comes to employment. In the meantime, please contribute to this blog via PayPal at the top right-hand side. I thank those of you who are regular subscribers and hope more will join. Finally, the death of Jacques Parizeau touched many Quebecers. Parizeau, a giant of the Quiet Revolution who nearly led Quebec separatists to victory, was instrumental in the creation and development of the Caisse and many other public and para-public organizations. Premier Philippe Couillard said the former Quebec premier will have a state funeral and the province will rename the Caisse de depot's headquarters after him. Parizeau leaves behind a complicated economic legacy and unfortunately is remembered for his comments blaming "money and ethnic votes" when the Parti Québécois (PQ) lost the 1995 referendum. I say unfortunately because far from being a racist, Parizeau actually did a lot for Quebec's cultural communities. Let me share a little story here. In 1976, after the PQ victory, the separatist government was threatening to close down Greek schools in Montreal because they weren't teaching enough French. The leaders of the Hellenic Community of Montreal approached my friend's father, Dr. Nicholas Mandalenakis, a pathologist at Sacré Coeur Hospital, for help. Some of the doctors at Sacré Coeur had contacts at the PQ government and a meeting was arranged with the then Minister of Education, Jacques-Yvan Morin. My friend's father spoke perfect French and convinced the minister to get funding. In exchange, Montreal's Greek schools would teach primarily French in their curriculum along with English and Greek. It is because of Jacques-Yvan Morin and Jacques Parizeau, the then Minister of Finance who quickly liberated the funds in days, that Montreal's Greek schools got subsidized and went on to be truly successful trilingual schools. At the time, some dumb, closed-minded Greeks in the media called my friend's father a "traitor" but he was instrumental in brokering this deal and still speaks highly of Morin and Parizeau for what they did back then. It's amazing how Quebec has changed since 1976. In some ways, I find it a much better Quebec but in others, it's gotten much worse. In particular, there are fewer and fewer opportunities for all Quebecers, including ethnic minorities and anglos, especially in finance. I worry a lot about the future of this province and the future of our country. Sadly, the leaders of yesterday aren't there today. Below, former premier of Quebec Jean Charest talks about his adversary and why he was a giant in Quebec politics. I also embedded a tribute to Jacques Parizeau which the Parti Québécois posted online. I also embedded Parizeau's last interview with Michel Lacombe as well as his interview with the CBC's Anne-Marie Dussault when he came out opposing the controversial Charter of Values. Also, take the time to watch Ms. Dussault's interview with former premier Lucien Bouchard here as well as his interview along with Mario Dumont on TVA News here. There were many tributes to Jacques Parizeau from friends and political foes, including a moving one from my former colleague at PSP, Jean-Martin Aussant, but take the time to listen to Mr. Bouchard as these interviews are excellent.